AKIPRESS.COM - A Mongolian Culture Centre has opened in the Tanjung Lesung Resort at the Indonesian island of Java, reports news.mn. The opening ceremony was held on November 26 as art of the programme of events marking the 60th anniversary of establishment of diplomatic relations between Mongolia and Indonesia. At the ceremony, Ambassador of Mongolia to Indonesia Sh.Battsetseg said: "It allows to see a Mongolian ger, nomadic history, culture, and lifestyle which have been recognized by UNESCO." 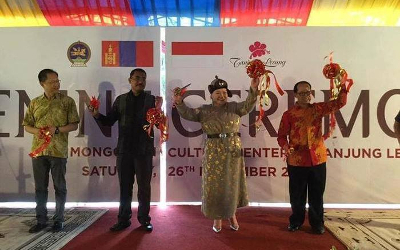 The organizers plan the Mongolian Culture Centre will be expanded into a ‘Mini Mongolia’ in Java island gradually.